Jefferson continues to paint a picture of the America of that day with a long antistrophe in which he does not use the same exact word, but the same type of word, in this case, a verb. In this description America is: rising, spread, traversing, engaged, and advancing. The sense is that America is active, growing, and healthy. The sentence concludes not with the simple end of a list but with an amplification of the sense that America is doing so well and moving so fast that it will reach "destinies beyond the reach of mortal eye." Jefferson then breaks off the syntax with a much firmer anacoluthon than before. This sentence is clearly meant to be read with greater and greater excitement at each verb until at the hyphen the speaker is overcome and pauses, only to come down to earth and, regain his senses (hence the use of "contemplate") and continue on. The use of "transcendent" implies not only the sense of the extraordinary but of divine ordinance, a sense he continues with "auspices," which subtly refers to the occasion of the inauguration itself, i.e. Jefferson's election by Americans under the law of the constitution. In between, though, Jefferson suggests it is the commitment of the people themselves that has created all of this prosperity by saying that "the honor, the happiness, and the hopes of this beloved country" are committed to the issue. Yet Jefferson does not want to "contemplate," a word he repeats, because thinking of the task it too great a strain. With another image of supplication, Jefferson says he "shrinks" and "before the magnitude" of the undertaking. The task is so great that he is utterly humbled and would despair, if not for the "high authorities" provided by the constitution. Jefferson is referring to the other authorities of the government, particularly the legislature. We must pause here and note that Jefferson is depicting his emotions as they are at the moment. He is saying that he would despair now except for the fact that the people of the legislature he just saw has reminded him that he has them to look to for guidance. It is as if Jefferson gets so worked up and nervous about the undertaking in the preceding sentences that he "shrinks before the undertaking," looks at the people, and being reminded of them and their goodness, regains his confidence. Only these performative touches can explain the syntax. Jefferson now addresses the heated and tumultuous election of 1800 between himself and John Adams. He describe the "animation" and "exertions" of the election not as the work of bad men or conspiracies, but rather the normal workings of a society in which men are free to think and act. People used to oppression ("strangers unused to think freely and to speak and to write what they think") are inclined to see it as terrible or dangerous but it is not, Jefferson implies. It is as if he says, "This is what a free election looks like." After the election, though, which was won by one individual according to the rules of the constitution, everyone will abide by the victory and the law and unite in common effort. Jefferson now begins to talk of the nature of democracy. Although by nature the majority must prevail, they must be reasonable. Although the majority rules, the minority never lose their equal rights and the law must protect them. To do otherwise is to oppress. Jefferson has addressed the legal aspect of democracy and goes on to address the social aspect, suggesting that the people ought simply, to get along in "harmony and affection." (With the "good old nature and good old humor" as his predecessor, who did not stick around for the ceremony, might have said.) Jefferson then boldly states that America would have gained nothing if it had traded in religious intolerance for equally "bloody persecutions" of political intolerance. During the throes and convulsions of the ancient world, during the agonizing spasms of infuriated man, seeking through blood and slaughter his long-lost liberty, it was not wonderful that the agitation of the billows should reach even this distant and peaceful shore; that this should be more felt and feared by some and less by others, and should divide opinions as to measures of safety. But every difference of opinion is not a difference of principle. We have called by different names brethren of the same principle. We are all Republicans, we are all Federalists. If there be any among us who would wish to dissolve this Union or to change its republican form, let them stand undisturbed as monuments of the safety with which error of opinion may be tolerated where reason is left free to combat it. I know, indeed, that some honest men fear that a republican government can not be strong, that this Government is not strong enough; but would the honest patriot, in the full tide of successful experiment, abandon a government which has so far kept us free and firm on the theoretic and visionary fear that this Government, the world's best hope, may by possibility want energy to preserve itself? I trust not. I believe this, on the contrary, the strongest Government on earth. I believe it the only one where every man, at the call of the law, would fly to the standard of the law, and would meet invasions of the public order as his own personal concern. Sometimes it is said that man can not be trusted with the government of himself. Can he, then, be trusted with the government of others? Or have we found angels in the forms of kings to govern him? Let history answer this question. Jefferson paints a historical picture in which the wars and violence of the ancient world and throughout history (the duration is emphasized by the light anaphora of "during") were all caused by man seeking his "long-lost liberty." It is unfortunate, he continues, that such agitation should have reached America. Jefferson then ties this love of liberty to the strife of the recent election, suggesting it was love of liberty, not faction or hatred or anything else, that some (i.e. he and the republicans) fought for. Jefferson continues with a maxim, "Every difference of opinion is not a difference of principle." That is, we may disagree about policy, but we all are "brethren of the same principle. "A most elegant turn of phrase. He continues with the most direct, "We are all Republicans, we are all Federalists." That is, we all desire a strong republican government, though we disagree about some specifics. Even if someone does not wish this most basic premise, Jefferson says, let us Republicans and Federalists leave this man in peace as a testament to the fact that the wrong can be tolerated when reason is free to combat it. Here Jefferson has woven republicanism, democracy, and federalism, and thus the political factions of the day, together by the notions of peace and of freedom of thought. The implication is of course if we can leave in peace someone who wishes to dissolve the union, then surely all who do not wish such dissolution can get along, that is, if men are free to think. He continues by saying that "honest" men lack faith in the government and its strength, honoring those who disagree with him. Yet he essentially asks these men, in apostrophe, "In the full bloom of our successes, why would you trade this in for a theoretical government?" The question obviously expects the answer of "no." Jefferson continues with the simple device of two short phrases with which he separates the preceding idea of the government's weakness and puts forth his own of the government's strength: "I trust not. I believe this." With a light anaphora he continues and describes why the government is so strong. It is strong because men care about the concerns of the government as their own concerns. He expresses this with the short pair of parallel clauses and antistrophe (repetition of the same word or phrase at the end of successive clauses): every man, at the call of the law, would fly to the standard of the law. Jefferson concludes this excellent passage with another truism, one which became famous: if man cannot govern himself, how can he govern others? The statement is of course sensible in the abstract but in the context of Jefferson's speech it reinforces the idea that the quality of a republican government rests on the quality of the men of the country. Jefferson adds on, though, "Or have we found angels in the forms of kings to govern him?" This addition addresses the potential answer of "no" to Jefferson's previous question of whether men can govern themselves. To people who believe they cannot, Jefferson says, in effect, "And why would a king be any better then? Are they better by nature?" The implication of course is "no." Since kings are no better and we can govern ourselves, let us pursue our principies of federalism and republicanism alongside our principles of union and representative government. Jefferson continues with another "verbal anaphora" larger than the one from the opening. Here Jefferson outlines the nation's blessings: 1) distance from foreign wars, 2) refusal to accept the degradations of fellow men, 2) a large and fruitful country, 3) rights to the fruits of our labor, 4) honor not from "high birth" but goodness, 5) a religion of truth which, though admitting different forms, inculcates in all of them "honesty, truth, temperance, gratitude, and the love of man," 6) the blessings of God. What more we need than all of this? One thing, Jefferson says. This is a highly dramatic moment since the list built to "Providence." What else could be necessary?
. . . a wise and frugal Government, which shall restrain men from injuring one another, shall leave them otherwise free to regulate their own pursuits of industry and improvement, and shall not take from the mouth of labor the bread it has earned. Such is the "close of the circle of our felicities," a most grand metaphor and beautiful turn of phrase, clearly meant to signify the beginning and end of an age. About to enter, fellow-citizens, on the exercise of duties which comprehend everything dear and valuable to you, it is proper you should understand what I deem the essential principles of our Government, and consequently those which ought to shape its Administration. I will compress them within the narrowest compass they will bear, stating the general principle, but not all its limitations. 1) Equal and exact justice to all men, of whatever state or persuasion, religious or political; 2)peace, commerce, and honest friendship with all nations, entangling alliances with none; 3) the support of the State governments in all their rights, as the most competent administrations for our domestic concerns and the surest bulwarks against antirepublican tendencies; 4) the preservation of the General Government in its whole constitutional vigor, as the sheet anchor of our peace at home and safety abroad; 5) a jealous care of the right of election by the people—a mild and safe corrective of abuses which are lopped by the sword of revolution where peaceable remedies are unprovided; 6) absolute acquiescence in the decisions of the majority, the vital principle of republics, from which is no appeal but to force, the vital principle and immediate parent of despotism; 7) a well disciplined militia, our best reliance in peace and for the first moments of war, till regulars may relieve them; 7) the supremacy of the civil over the military authority; 9) economy in the public expense, that labor may be lightly burthened; 10) the honest payment of our debts and sacred preservation of the public faith; 11) encouragement of agriculture, and of commerce as its handmaid; 12) the diffusion of information and arraignment of all abuses at the bar of the public reason; 13) freedom of religion; 14) freedom of the press, 15) and freedom of person under the protection of the habeas corpus, and 16) trial by juries impartially selected. These principles form the bright constellation which has gone before us and guided our steps through an age of revolution and reformation. The wisdom of our sages and blood of our heroes have been devoted to their attainment. They should be the creed of our political faith, the text of civic instruction, the touchstone by which to try the services of those we trust; and should we wander from them in moments of error or of alarm, let us hasten to retrace our steps and to regain the road which alone leads to peace, liberty, and safety. Jefferson, having just mentioned the essential characteristic of good government necessary for a "happy and prosperous" people, and about to take charge of the executive branch of that government, tells the people "it is proper" that we understand his principals of government. Jefferson then articulates fifteen highly specific principles. He then describes them poetically as, "the bright constellation" which has guided us through revolution and reformation. Jefferson then uses a shifting tense to suggest a course of action. These principles guided us in the past, they have been sought (and continue to be sought in the present) by our sages and heroes, and they should be the creed of our political faith in the future. Jefferson adds to this credo the very human element of error, noting that should we stray, since this is the only way to "peace, liberty, and safety" that we simply ought to return to the path. Jefferson begins his conclusion by returning to a tone of humility presaged by the previous sentence and the image of "straying from the path." Jefferson's experience has not, he tells us, rendered him fit for the job. Rather it has taught him that no one, no matter how perfect his reputation when taking the job, will leave office with the same favor. He says, "I don't ask the confidence you had in Washington because he deserved such, but only the confidence needed to administer your affairs. When I am right, some of you will still disagree. When I err, pardon me." 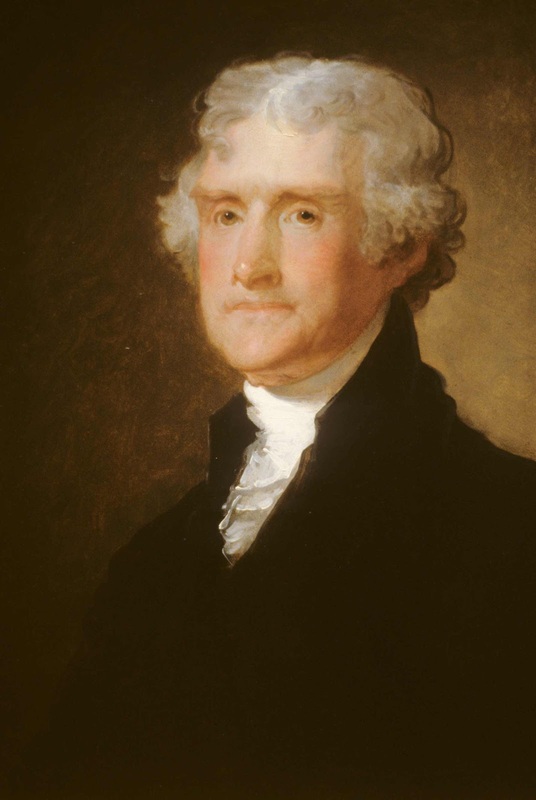 Jefferson thanks the people for holding a good opinion of him in advance of doing the job and hopes to earn their esteem by being "instrumental to the happiness and freedom of all." Of all the notes to end on, Jefferson reminds the people that they may replace him whenever they think someone better can do the job. Lastly, he asks for divine guidance. The themes of this speech could not be any clearer. First, Jefferson is humbled before his election by the people and the duty of the office. Second, America is a nation of great laws and good men. Third, Jefferson has specific principles of government which will guide him and his administration. He is repeatedly deferential to the will of the people and thus congress. He makes great efforts to include all Americans in the speech and not only to acknowledge, but to reach out to, praise, and empathize with those who disagree with him or the government itself. This is a most elegant speech. It makes sparing but effective use of poetical language and rhetorical devices. No part of speech predominates and Jefferson is not especially prone toward lists, pairs, or particular constructions. The style is direct and concise, relying mostly on the precise use of specific and effective words and the conveyance of particular ideas. As such this speech achieves a remarkable clarity of purpose. The argumentation is neither highly complex nor in any way indirect. Let us again consider Aristotle's categories from his Rhetoric. From them we may say that the inaugural speech has two functions: for a president to outline his particular ideas and policy, and to celebrate America. This is in fact precisely and only what Jefferson's speech does. Jefferson praises the goodness of Americans, its fortunes, and its government, and then lays out his principles of governance. Aristotle also noted (Rhetoric I.ii) that three modes of persuasion exist: 1) of the personal character of the speaker, 2) putting the audience in a particular frame of mind, 3) proof or apparent proof of the words themselves. Which does this speech use? This may be reformulated as: When reason is left free, even if there is disagreement, it is a sufficient bulwark against lack of reason. Thus what appears to be aphorism or assertion is actually able to be unpacked into an argument. Jefferson here is not just laying out plans but principles. One may disagree, but the ideas, their compactness, simplicity, and even the assertiveness of their tones, comprise the persuasion. Also, by saying them alongside other ideas and arguments, he is implying they are compatible. Jefferson is saying that these things are so, and he is articulating these ideas so clearly that they seem self-evident. Such clarity is the essence of the speech and it is Jefferson's lucidity, his precise diction, straightforward arguments, and the specificity of the ideas which are the tools of persuasion. The style is neither florid nor spare, trendy or archaic, syntactically dense or thin, too long or too short, but beautifully balanced. This balance engenders a clarity that gives the ideas their potency and thus the speech its considerable persuasive power. It is a specific vision elegantly expressed.